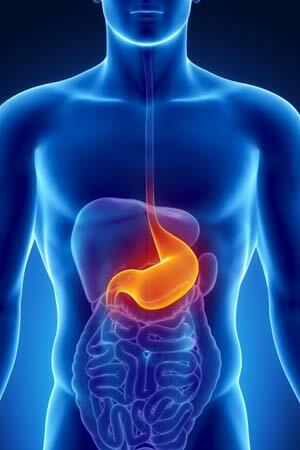 Stomach cancer, also referred to as gastric cancer, is an uncontrolled growth of abnormal cells in the stomach lining. There are many types of cancer that can occur in the stomach, most of them starts from the common cell types found in the lining of the stomach. Stomach cancer is categorised on the basis of the type of tissue where they originate from. The most common stomach cancer is adenocarcinoma, accounting for 90% to 95% of all stomach cancers, starts in the glandular tissue of the stomach. Among other forms of stomach cancer include lymphomas (originate in the lymphatic system) and sarcomas (involve the connective tissue such as muscle, fat, or blood vessels). The following factors increase the risk of stomach cancer by manifolds. A diet high in salted or pickled foods. Chronic stomach disorders such as gastritis. Family members who have been diagnosed with stomach cancer. Genetic abnormalities of the family members increase your risk of developing the cancer form. Being male; stomach cancer is more common in men than women. Helicobacter pylori (H. pylori) infection of the stomach, an infection caused by H. pylori bacterium put one at greater risk of stomach cancer. The bacterium infects the lining of the stomach to cause chronic inflammation and ulcers. Medical conditions such as chronic gastritis, pernicious anaemia, gastric polyps and intestinal metaplasia elevates the risk of stomach cancer.